The 1987 stock market crash occurred on Monday, October 19. The week before was marked by high fear and heavy selling, with the S&P 500 shedding 9.12% between Monday, October 12, and Friday, October 16, 1987. 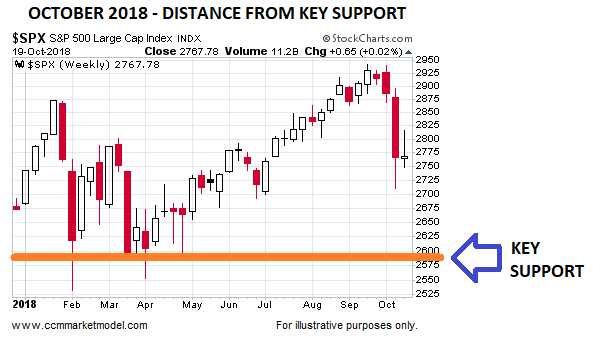 Unlike the pre-Black-Monday close, the close on Friday, October 19, 2018 was well above a key area of possible support. Why is the chart above relevant? Because in 1987, the market was in somewhat of a “make or break” posture before the 1987 crash. The present day market has numerous forms of possible support below price as outlined in detail on October 15. 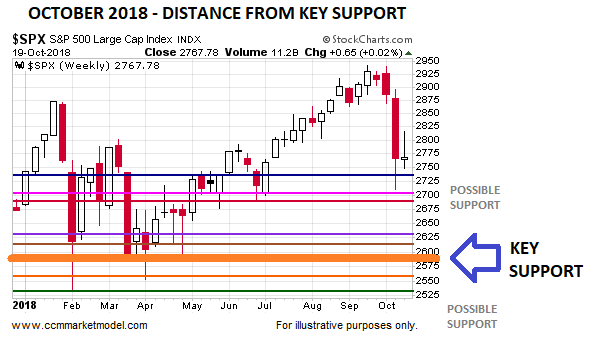 Therefore, the 2018 market has secondary forms of possible support above and below the key area of possible support (see chart below). The opening segment of this week’s CCM stock market video takes the 1987 vs. 2018 comparison to another level of factual detail. The video also covers a key signal that has only occurred three times since 1934, comparisons to the 2000/2007 peaks, and reasons to keep an open mind about the stock market forming a bottom in the next 1-2 weeks. Older PostIS A 1987-LIKE CRASH IMMINENT?